7 Stuck on "Kill or talk to Kematu"
"She claims that she is actually a noble from Hammerfell, and the Alik'r have been sent after her because she publicly spoke out against the Aldmeri Dominion." "Both sides will claim to be acting against the Aldmeri Dominion and both sides will claim the other is acting on the Dominion's behalf, so it's not really clear who's on what side. Additionally, there are no notes or other clues to either verify or falsify the truthfulness in either party's claims." Seeing as the Redguards continued to defy the White-Gold Concordat, Hammerfell was released as an independent state and the AD completely withdrew...is it really plausible that she had to leave for opposing the AD? Even if she did, it wouldn't make much sense for Alik'r to be chasing her on behalf of the AD once Hammerfell completely forced them out, right? I find it makes much more sense, according to the lore, that she is indeed being hunted down for supporting the AD, rather than speaking out against them. Stuck on "Kill or talk to Kematu"
The bug "If you do not directly kill Kematu (i.e., Frenzy or Fury on him or the Alik'r), the quest will be stuck on "Kill or talk to Kematu". See Quest Stages and skip to step 160 to progress the quest." is labeled as unconfirmed, however I encountered it on PC today. Just a note around the bug having to do with clearing the cavern. I completed the quest a long time ago, taking Kematu's side. Swindler's Den was marked as cleared. 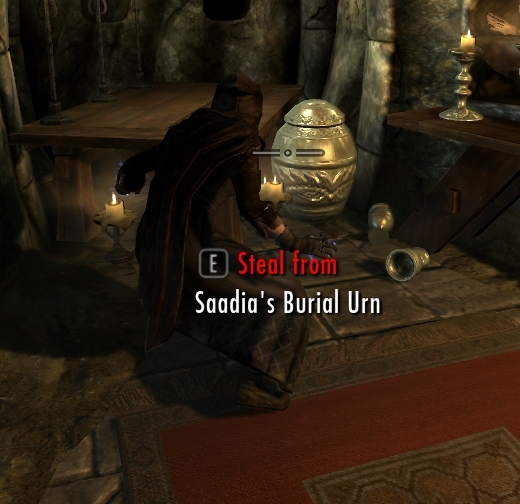 Then, much more recently, I started some of the Companions' quests, and got sent back to Swindler's Den to find a piece of Ysgramor's axe (this is the radiant system, I guess?). There were plenty of bandits on the way in, just like before, and then the Alik'r were back in the final cavern again. I starting killing them before I realized who they were, so I don't know if there were any dialog options. This page was last modified on 6 August 2018, at 23:29.